Flowers are meant to bring cheer and beauty to your surroundings with their jewel colors and enchanting fragrance. Cool season flowers put up a good show in spring, and then again in fall in some cases. Tender plants survive only for a summer. Use the following tricks to keep your garden in one continuous floral display from early spring to late fall. When you buy seedlings in flats, you should look for lush, bushy growth. These plants tend to be stronger and capable of handling adverse conditions later. If you’re starting seeds indoors, make sure they get enough water and light. Direct sown beds should be thinned, leaving only the healthiest seedlings. Soil rich in organic matter provides plenty of nutrients to the growing plants. Rich soil promotes good root run and lush vegetative growth, which will ensure plentiful flowers and a longer flowering period. Some plants like lavender seem to prefer light soil poor in nutrients. Some plants flower prolifically when grown in poor soil and drought-prone areas, but the flower show could be all too short. A good sized plant with plenty of branches naturally produces more flowers. If you happen to see flower buds in young seedlings, remove them promptly. Feed them some nitrogen-rich fertilizer like compost tea to promote vegetative growth first. Deadheading is a popular and proven way to keep plants flowering for longer. If the flowers are allowed to remain on the plant beyond their prime, the plant may move onto the seed setting stage. Cutting flowers for vases and bouquets is a great way to enjoy your garden indoors as well as outdoors. Regular feeding is essential to meet the high demands on nutrients needed for keeping the plants in bloom. One should ideally start with nitrogen-rich fertilizers to promote initial vegetative growth. This should be followed with a formula that is high in potassium and phosphorous. It is possible to keep your plants going a bit longer by giving them extra water. You will notice your plants wilting in the afternoon and then getting revived during the night. This wilting shortens the lifespan of the plants, and they hurry onto the next phase. That would practically put an end to the flower show. Increasing soil moisture and spraying the plants with water, especially in the afternoon, raises humidity. Providing shade can sometimes keep the plants blooming for a few weeks more. Shade screens can do it very efficiently, but they may mar the aesthetics of your garden. A better way would be planting summer and fall flowering plants closer to the spring flowers. They will grow tall enough to provide some shade by the time it gets too warm for the spring plants. Mulch keeps the soil cooler by a few degrees when the temperature rises in spring, and helps retain soil warmth for a little longer in fall. Apply a thick layer of mulch around the plants. With extra watering and some amount of shade, you will be able to extend the flowering season for a few more weeks. Cutting back the growth by one-third usually helps many flowering shrubs to grow a new set of stems tipped with flower buds. Some plants like Foxglove, Delphinium, Pincushion flower, and Salvia have a basal tuft of foliage from which tall flower spikes arise. Coreopsis, Columbine, Stoke’s aster, and Crane’s bill Geranium may put up new growth and offer another set of flowers if you trim them down almost to the ground. A good pruning has to be followed by a good feeding to coax the plants to flower again. The second flush of flowers may not be as fabulous as the first one, but they help extend the flowering season by a few weeks. Give a high-phosphorous formula to let the plants focus on flowering. This is mainly useful for bulbs which bloom only once in a season. 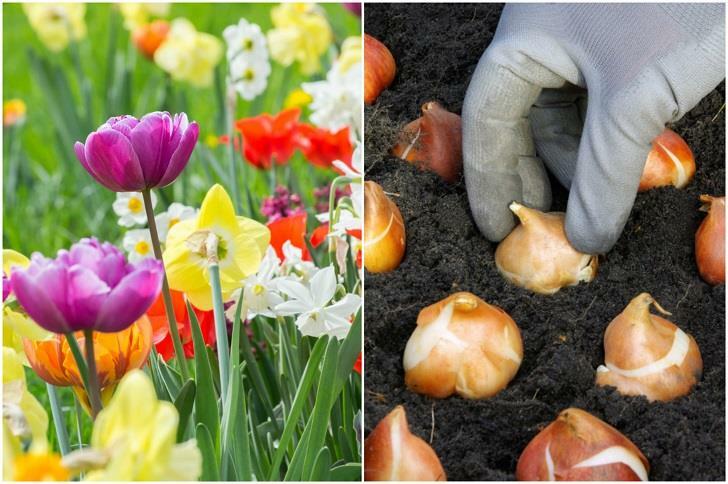 In order to keep your garden in flowers throughout the season, plant several batches of bulbs at weekly or biweekly intervals. Mix early flowering cultivars with late-flowering ones and you will help extend the season.